Korma is not one particular dish but rather a name given to curry that is both mild and creamy. It is often described on restaurant menus as a mild dish, however, korma is anything but bland. There seems to be several versions using key ingredients such as ground almonds, cashews, toasted coconut, almond slices, and/or golden raisins for a variety of nutty sweetness in the sauce. Then, traditionally, cream, coconut milk, or yogurt is added at the end. All in all, not one method is correct or incorrect as they all are good. This recipe comes very close to that of one at our local Indian restaurants and I must admit, it is a winner. It has a touch of heat from the chilis. The spice blend is just right. And, the nuttiness from the ground almonds and slivered almonds pair well with the sweet golden raisins. Cut the chicken in bite sized pieces, about 1 inch. Place the chicken in a bowl or plastic bag and add half of the ginger and garlic. Add the yogurt and mix together. Marinade in the refrigerator for at least several hours, preferably for 12 hours or overnight. Put the onion, remaining ginger and garlic, chilies, and salt in a food processor and blend until smooth. Scrape down the sides of the bowl if necessary. Add the ghee/oil in a large saucepan over medium-high heat, and pour in the onion mixture. Bring to a low boil, reduce heat to a simmer, and cover. Cook for 15 minutes. Remove the lid and continue to cook for another 5-10 minutes. Stirring often. Add the turmeric, paprika, coriander, bay leaves, chopped tomatoes and tomato purée and cook for 3-5 minutes over medium to medium high heat. Add the chicken and marinade, stirring to blend all the ingredients. Cook the chicken for an additional 10 minutes, continue to stir occasionally. Add the coconut milk and return to a low boil. Add the ground almonds, garam masala, and cumin. Stir to combine. Reduce heat to a simmer and cook for another 20 minutes, adding the almonds and raisins about halfway through. Taste and add salt and freshly ground pepper if necessary. Remove from heat and sprinkle with freshly chopped cilantro. Serve with basmati rice and naan (if available). 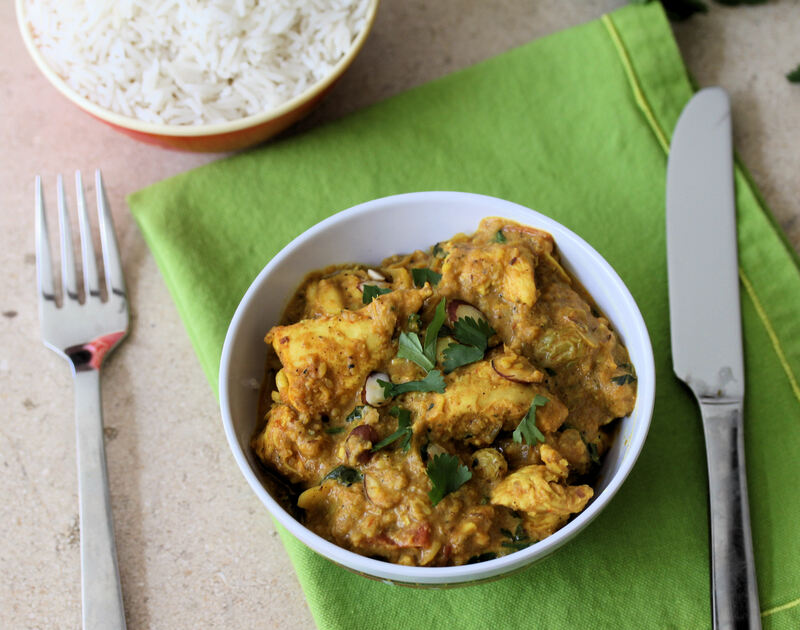 This entry was posted in healthy options, main course and dinner, soups and stews and tagged almond, chicken korma, coconut milk, curries, ethnic, indian curry, korma, korma recipes, raisins, rice. Bookmark the permalink. Ooo, that looks so delicious! I’m definitely going to try this! Bookmarked! I made this tonight with a few changes, i.e. I used a 1/2 pint jar of homemade tomato sauce (tomatoes are out of season), left out the raisins, and used a chicken masala I got in India. I also accidentally reduced the onion sauce way too much but it turned out fabulous. The most authentic Indian taste yet. Thanks so much. 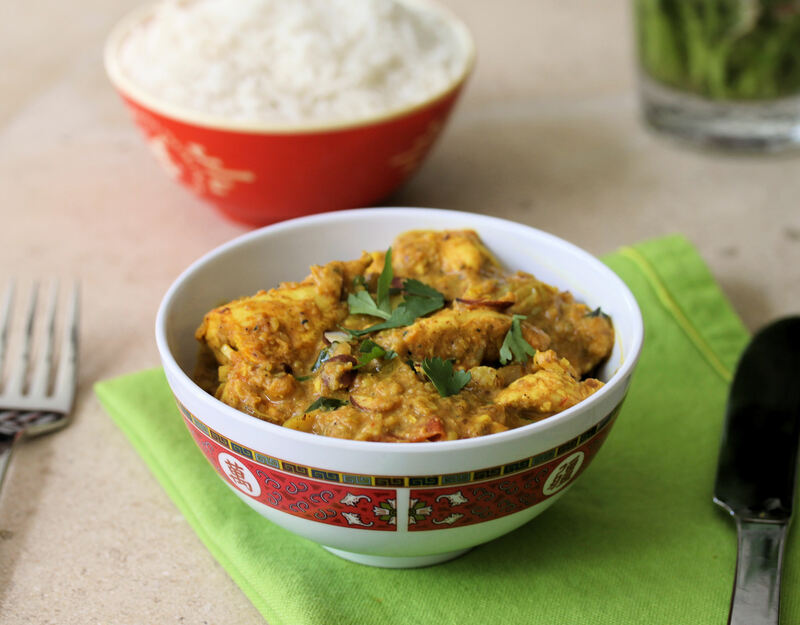 Chicken Korma looks delicious and mouth watering.